Alexandra Barratt is Professor Emeritus at the University of Waikato, New Zealand, currently working on manuscript waste in New Zealand manuscripts and early printed books. The Auckland Public Libraries possesses a huge four-volume early printed Bible with gloss, 1480 BIBL, presented by Henry Shaw, a wealthy accountant who gifted many incunables and manuscripts to the city, in 1911. The book (ISTC ib006070000) was probably printed at Basel by Johann Amerbach, for Adolf Rusch and Anton Koberger, not after 1480. It is not by any means a rare edition: ISTC lists several hundred surviving copies. Like all such fifteenth-century printed bibles, the sheets were bound and the coloured initials, rubrics and other decorations added by the purchasers, who in this case were the Benedictine Abbey of Benedictbeuern, near Munich, whose usual ownership inscription, “Iste liber est monasterii Benedictpeiren”, occurs several times throughout the volumes. The Abbey, whose library was renowned, was secularised in 1803 and most of its books went to the Bayerische Staatsbibliothek, which still holds no fewer than thirteen copies of this particular edition. But some duplicates were sold off and this copy came into the hands of the English (or Scottish) book collector Cornelius Inglis (b. 1824, posthumous sale 1900), son of John Bellingham Inglis (1780-1870), and ultimately of Henry Shaw. Sometime in the nineteenth century – before Shaw bought the set, as the bookseller’s catalogue entry that he preserved notes the fact – all four volumes were rebound in the kind of brown morocco, tooled in gold, regarded as de rigueur at the time. And as soon as readers open any volume in the set, they are confronted with striking pastedowns taken from a late medieval antiphonal. Hence, when the books were recently recatalogued, they were tagged as containing “manuscript waste”. But the rebinding preserved some far more interesting examples of waste. 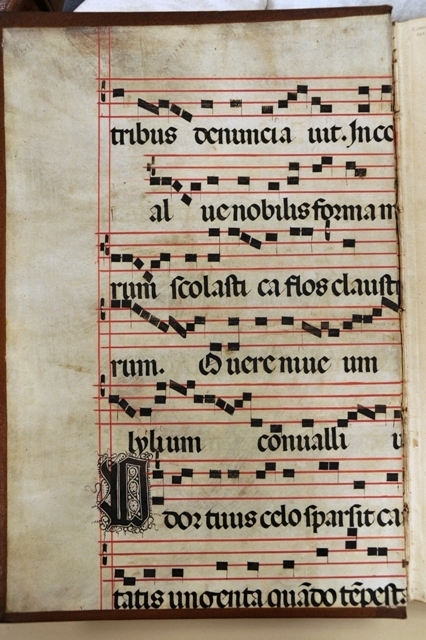 In volume one, at the centre of each gathering, are sewn strips of vellum cut from a noted twelfth-century gradual, with texts mainly for Lent (i.e. possibly from the second half of the Temporale). Twelfth-century fragments are not unknown in New Zealand, and these were rapidly put in the shade by the quire guards in the remaining three volumes. There was one sewn into the centre each of the quires (about 35 in each volume), and although only nine of them were legible, it was obvious that they were from parts of the Old Testament. The script was early, and dated from photographs by Christopher de Hamel as ninth-century, Carolingian, very close to AD 800. They were therefore the oldest known medieval manuscript fragments not only in New Zealand but also in Australasia and, quite possibly, in the southern hemisphere. Bernhard Bischoff, Die Südostdeutschen Schreibschulen und Bibliotheken in der Karolingerzeit Teil I: Die Bayrischen Diözesen (Wiesbaden, Otto Harrassowitz: 1974) was consulted to see if there might be other fragments from the same manuscript surviving. The visible texts in 1480 BIBL were identified as from Exodus, Leviticus, Numbers, Ezechiel, and Hosea, and there seemed to be two promising fragments in the Bayerische Staatsbibliothek: Clm 29260(1, containing texts from Genesis, Leviticus, Numbers, Deuteronomy, and Judges, and Clm 29260(2, containing texts from III Kings and II Paralipomenon. It was particularly intriguing that according to Bischoff these fragments had probably came to Benedictbeuern at an early date from Kochel, an associated women’s religious house situated nearby, and were therefore written by female scribes – indeed, some of the earliest examples of women scribes writing in Europe. Coincidentally, in July 2012 Sotheby’s auctioned some more Kochel fragments from a different but similar manuscript, two fragments of bifolia made up of reconstituted guard strips. The Bayerische Staatsbibliothek was sent some photos of the newly discovered fragments and kindly confirmed that the hand was the same. as Clm 29260(1 and (2. BSB has an extensive programme of digitisation which includes these leaves (http://daten.digitale-sammlungen.de/bsb00071129/image_3), but later a visit was made to Munich to see the matching fragments, which consist of twenty folios or parts of folios. This visit also facilitated further work on Volume One, which had been somewhat neglected. 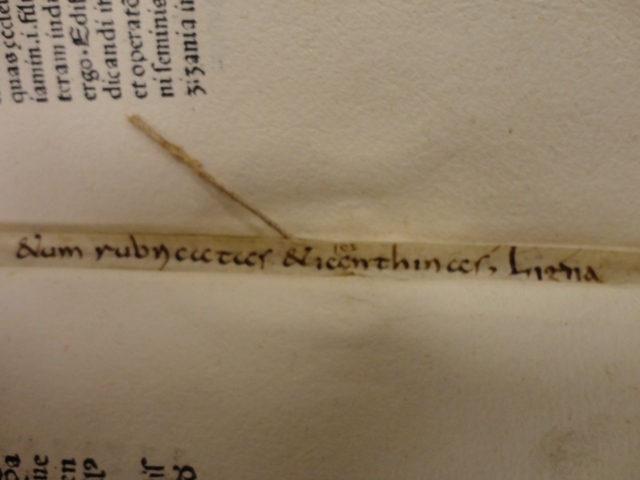 Fortunately the BSB had been working on a catalogue of manuscript waste in incunables. This contained only one early printed book with anything from a 12th century Benedictbeuern gradual in it: 2 Inc.s.a. 1179, which comprises two volumes bound together, Nicolaus de Byarto, Flos theologiae and Johannes de Turrecremata, Questiones evangeliorum, Basel, Johann Amerbach, not after Sept. 1481. The fragments consist of two folios used as pastedowns, and they matched the manuscript waste from volume 1. The (re)binding was a final puzzle. Why were the quire guards were there at all, given that the books had been rebound in the nineteenth century and there could be no question that the re-binder could have inserted them. In addition, a question had been raised about the endbands which, on closer examination, appeared to be braided from alum-tawed leather lacing, possibly originally in two colours. They had to be fifteenth-century. The pastedowns were puzzling too: at first they seemed to have been added by the re-binder as a decorative touch, but on closer inspection it was clear that they had been hooked around the first and last quires and sewn in, so must have always been there. I hypothesise that the nineteenth-century re-binder had planed down the original wooden boards so that they were thinner, smoother and tidier. This would also have removed the original beveling and any marks from earlier furniture such as bosses and clasps. He then covered the boards in brown morocco, tooled in gold, and coloured the foredges with a greenish-yellow stain. 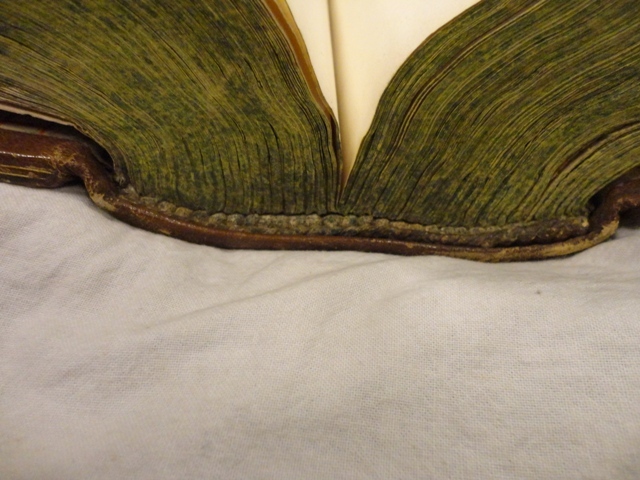 What had been the fly leaves were then glued down over the leather turn-ins, becoming pastedowns. The result: a rebound four-volume set in fashionable morocco, with the original fifteenth-century structure (including the sewing guards) still intact underneath. I would be interested to know of any other examples of such a practice. Images here are reproduced by kind permission of Auckland Public Libraries; thanks especially to Kate de Courcy for her assistance. The History of Western Script: Sixty Important Manuscript Leaves from the Schøyen Collection (London: Sotheby’s, 2012), 72. Lot 32, Schǿyen Collection sale.